Here's what you can get up to in Santa Eulalia between now and the end of the month and even beyond. October is still a great time to visit Ibiza. Santa Eulalia is a always a busy hub with lots of great things to see and do for the rest of the month and as we enter the low-season. In fact, it really is a great place to visit at any time of year. As temperatures cool, all those activities that seemed too strenuous in the thick of summer, suddenly appear a little more attractive. Equally, you can spend more time outdoors without fear of over-exposure to the elements. With plenty of choice of places to eat - including on the famous "restaurant street" along from the town hall - and easy access to nearby villages and beaches, you'll be able to enjoy this part of the island easily staying here. Whether you're arriving with little ones in tow or enjoying a couple's retreat, this is a destination for the more discerning holidaymaker. We've rounded up a list of things you can do in and around Santa Eulalia until the end of the month and beyond. Santa Eulalia has a great central promenade and a lovely stretch of paved promenade in front of the beach. Go towards the right and walk to the end and you reach the island's only river that runs into the sea at Mariner's Beach. A bit farther beyond that walking upwards is the town's old Roman bridge. Towards the left is the lovely boat marina along with a number of eateries around it. Walking around, there are many cafes and restaurants in which to while away time and eat great food. Food lovers might want to visit the lovely covered market next to the bus station to see an array of fresh food including cakes and pastries. There's even a cafe inside for a quick pit stop. Go up above the town to its lovely old church Puig de Missa (literally, hill of the mass) and get panoramic and breathtaking views of the town. In its cemetery take a look at the names on the tombstones and you will find many European names, often dissidents that came for Ibiza's peace and protection. Also, here is the Ethnographic Museum that shows how life was lived in Ibiza's self-sustaining past. For something exhilarating and completely free, explore Santa Eulalia's beautiful coastline. Take the northbound walk to Cala Martina and indulge in freshly caught sardines at its chiringuito Some lovely beaches are close to here too such as Cala Pada and Es Niu Blau. Further north there's the lovely nudist spot Aguas Blancas and the sparklingly pretty Pou des Lleó - these beaches would be better reached by car. A mere ten-minute drive from the centre and going south, Cala Llonga is an especially popular choice - and for good reason. Its shallow waters make this a family-friendly beach. Even as we head ever-closer to off-season, the sea remains unseasonably warm. Should you wish for a change of scenery, it's only an hour transfer from here to the white sands of sister island Formentera. Even the views en route are breathtaking. Open until 31 October, adventure assault course Acrobosc definitely ticks those boxes. Zip-wire through forest canopies, ascend cargo nets and walk the tightrope. Acrobosc is adrenaline-fuelled fun for kids and big kids alike. Staying grounded, but no less thrilling is the Ibiza Jeep Safari. The terrain might get a little tough and bumpy, but the pay-off is that you will see parts around Santa Eulalia inaccessible by any other method of transport. With many areas looking especially green and luscious right now, you will really see Ibiza in another light as the autumn wilderness returns. 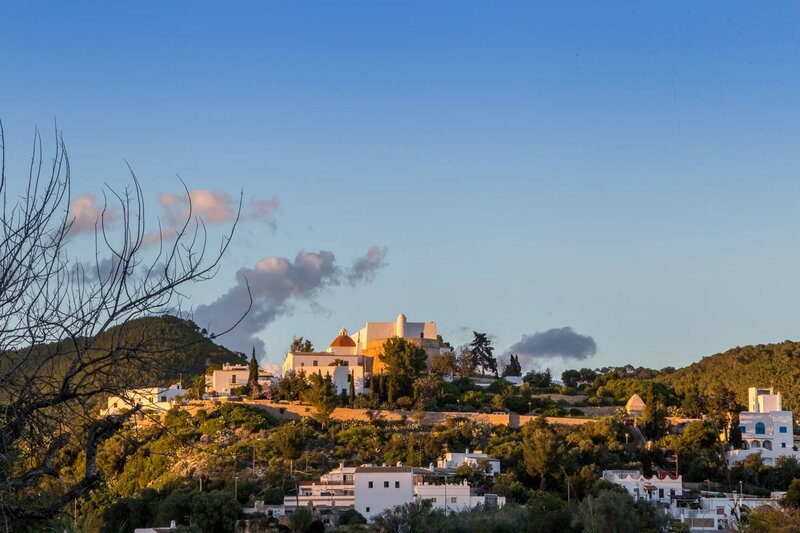 All year round, Ibiza hosts cultural festivals, and October is no exception. From now until 24 November the San Carlos Fiesta has a wealth of events to celebrate this time of the year. The main day is on Sunday 4 November with traditional folkdance and a race of devils, demons and imps. The festivities are already well underway, with daily open air concerts and gastronomic events coming up. Getting out and exploring the extended area should be top of your agenda on any holiday. Santa Eulalia is the ideal base to check-out Ibiza's greener north. An easy way to do that is on the fun-filled Tourist Train. Running until 29 October, the train takes travellers on a tour of the unspoilt north of Ibiza. Excursions run every day, but you might like to consider the Saturday trip, that takes you to the bustling hippy market of Las Dalias open just about every Saturday of the year- a firm Ibiza favourite. Wander around the stall, barter with the seller or just soak up the atmosphere. The choice is yours. Even for those who have booked with board included in their accommodation package, the food offering in Santa Eulalia is so sumptuous, you'll be missing out if you don't dip your toes in. With lots of restaurants to choose from and many open all year round, you're spoilt for choice. On a budget? Don't worry. On Thursday 25 and Friday 26 October, the Tapaví tapas event takes place in the town many restaurants involved such as Ca Na Ribes and Royalty. Get a selection of seven tapas for the bargain price of €15. Great value for those with many mouths to feed. Wine and music included. Many of Santa Eulalia's restaurants are also taking part in the Ibiza Sabor festival that runs until December. Three-course gourmet menus in top restaurants for just €25 ahead - you really can have more for less. More food fun at the San Carlos Calamari Festival takes place this Saturday 27 October, a great event to celebrate this succulent seafood beloved by the Spanish. There really is a lot to do in Santa Eulalia at any time. It's time to discover it for yourself.